You try to find the very very old, yet useful “Classical Publish Settings”, in the new Azure Portal ?? Then it still works ! With the recent announcement of an even closer partnership between SAP and Microsoft, I got the fantastic opportunity the visit SAP EBC with my VISEO Top Management and Key Account Managers. Indeed, as Microsoft Regional Director in charge of the Azure strategy for the group WW, the SAP management welcomed us and congratulated us on the job done in 2017, and challenges us to become again one of the TOP 5 best partner. Despite I am into innovation and very high tech, I must admit that I was REALLY REALLY REALLY REALLY impressed by the Innovation center (an entire massive floor dedicated to innovation). Here is one of the room where we have a concentrated amount of digital innovation. And, despite many people will like the Retail showroom, I really much prefer durt and robots, which are my favorite topic : real-time Machine Learning embedded in devices off-line and Instrstrial IoT with OPC UA standards. We also had a presentation of a very robust, yet Lean, Innovation SAP process ! These sessions was a great source of inspiration and I already for few ideas that made come true ! 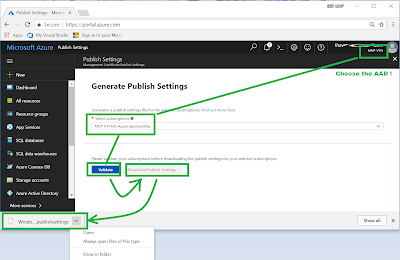 Cannot add your account into VSTS–Visual Studio Team Services ? This is a very common question that I have. Also this is quite easy for “us” using VSTS for the last 5 years, because VSTS is so spread out, that some people do no know how to add new users into VSTS. The first 2 choices are THE recommended solution in terms of security (where you could also add multi-factor authentication to further improve security). Besides, when the user leaves the company, he automatically looses its access to ALL corporates accounts, including VSTS. The third option is however used as a “hack” to provide quickly access to VSTS without having the pain to go thought the IT department connecting VSTS to the AAD. Origin of numerous confusions : when mixing the two !! If you have a Corporate Account say FName.LastName@Viseo.com, you were able to “convert” it into a Microsoft Account (not possible now for many reasons). But now, when you Log In, you have 2 choices !! (as per today, we have 2 portals : new one as default, and a button to switch to the former one. See next). HOW TO CREATE A Microsoft Account (former LiveID) ? APPENDICES and ADVANCED and LINKS ! ScottGu is coming to Paris!! Hurry up to prepare a great 2.5 hours Hands On Lab, on realtime DataScience on Azure IoT Edge! The detailed of the HOL will be available at the end on Github. Below is a v1 introduction for the HOL (will be updated iteratively). 1 Introduction and why this Hands On Lab ? IoT has been around approximately since 2000, and prior to that M2M (Machine to Machine), with sometimes some industrial standards such as OPC and later OPC UA, and sometimes no standards at all and only proprietary protocols. We notice that sending back and forth the data through the network is not efficient at all (ex. 3D X-Ray Scanners cannot send 2 TB of Data per second to the Cloud for processing). 3 What Azure IoT offer in terms of Edge Computing in one sentence ? BEFORE starting the Hands on Lab / Tutorials, because the entire process is quite complicated, we will explain, as an overview the end-to-end high level scenario. In the HOL, we will see that the extensibility allows us to replace the Module “Azure Stream Analytics on Edge device” by another on composed by your Module containing your own Python code, produced by your DataScientific. When using the ML model over and over, we will need to monitor and ensure that the model has not shifted beyond a given limit. or a prediction (according to the heat, the number of hours used, etc… the 4rth fan will be out of usage in 3 days). And beyond a threshold of 24 hours, send a purchase order of an identical fan and as soon as I got back an internet connection. Use the Azure IoT Hub that your know, and locate the property Azure IoT Hub Edge. 4.4 On “all sides”: The Fun part ! Let’s summarize with a different comparison. Let consider a human with a central brain that centralize the decisions: Complex decisions and Simple decisions. When our leg gets burnt, the hurting information do not need to flow back to the brain. By reflex, the leg automatically moves away from the fire. Indeed, it would have taken too much time for the leg to send the information to the brain, wait for a decision, and sends the conclusion back to the leg. Rather, the leg relies on local decision for “simple” actions to be taken. That’s the entire idea of Azure IoT Edge: Have centralized and managed decision in the Cloud, and we rely on local devices that could take decisions, and report it back to the Cloud to carry on further complex decisions. Now because the complexity is handled mostly by the Cloud, then pushed to the Edge, we have a kind of duplicated information, or call it a “twin” notion. Now try coding that using the old fashion way with Assembler or C : How many months or years would that require ? and would that work and the code maintenable ?? Next, I will carry on explaining why Azure IoT Edge is pseudo-complex, but the majority of the complexity is encapsulated behind Microsoft’s technology. 6.1 Why is it so complex ? - allow “user friendly” yet powerful code such as Python to be developed an entire IoT+processing+ML system and deploy that (using Docker) all the way to the Edge, via the Cloud that supervises that all. Thus, Microsoft relies on opensource and cross platform technologies that could be ported to any other platform for reversibility needs. Since we are using a regular Docker, we could extend the features by adding any additional ones. Imagine all this working … with No Internet AT ALL, and with medical regulation constraints, … and even worst … this should work in France with endless crazy regulation ?? Would that be a dream and totally unfeasible ?? Now imagine, extend all this to SAP and Dynamics365 and with an IoT System without coding anything at all ?? Not possible ?? Azure IoT offers an entire ecosystem, very rich, open and extensible, from Edge to SaaS, that was build with security and DevOps in mind. Now it is important to pickup the proper options and design an IoT architecture that suites the needs : that’s the job of IoT & Cloud Enterprise Architects or Cloud Solution Architects.